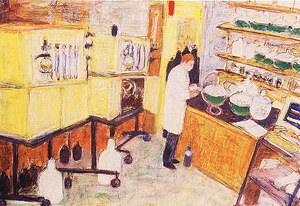 In the university medical center, the chemist monitors the synthesization process in a peptide study. The chief of the laboratory praises the beauty of American academic research system, ‘We just don’t realize what we have got here, complete freedom to work on any project that we want to!’ He discussed his work today. It has been 10 years since I had drawn a technician in his laboratory. "Quantitative things are better. We know lots more today about what these things are doing when they bind to the cell in terms of triggering intracellular processes. We are beginning to be able to understand a lot about recessive molecules, characteristic structure, and function. So we have a lot more approaches to a particular problem. We know all this ties into molecular graphics. We can figure out three-dimensional structures of both the small and large molecules as a receptor from two different directions. We can create a drug."